At Endeavor Plumbing we work tirelessly to provide the best plumbing service to all residents of Canterbury. In a suburb as compelling and exciting for both families and businesses, the last thing you want is a faulty plumbing system that ruins it all for you. 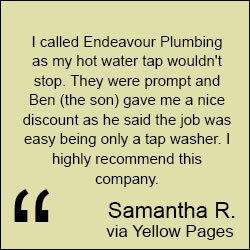 Why would you choose Endeavour Plumbing? A faulty plumbing system will always impose many inconveniences no matter where it takes place. Fortunately, for our clients, our staff is willing and ready to take care of any problems that may arise. With 40-years of hands-on experience in the heart of the industry, we know a thing or two about repairing and restoring plumbing systems. Our passionate attitude to learning new plumbing techniques and equipment, coupled with our dedication to giving 100% to complete any job or project puts us ahead of other plumbing services in Canterbury. Who can call Endeavour Plumbing? Our client base is diverse; whether you are a homeowner, business, or commercial organization, we have all of the tools necessary for all types of establishments. That is thanks to our dedication to offering competitive and affordable prices for all our services. We want our clients to understand that we are here to help them with all their needs and not to price them out of getting quality and professional service. What can Endeavour Plumbing offer Canterbury residents? Above all things, our customers are our priority. Since we began our business, we have always taken great pride in our consistent delivery of high quality customer service to all our Canterbury clients, by continually providing strong communication throughout our time with them. We always work hard to guarantee the satisfaction of all clients, making sure that all of their needs are met. We place an immense amount of pride in our work, and strive to leave each and every work site in the best conditions possible. No matter how big or small the task at hand is, you can fully rely on us to complete it in a timely manner with the highest quality. Our professionalism is present from beginning to end, and we will always work with you patiently to figure out the best solutions for any problems that your plumbing system may be facing. All of our staff is proficiently trained in all aspects of the plumbing trade, so you will never have to worry about any job being too difficult or complicated. We always keep our prices affordable and fair for all of our clients, ensuring that you will be receiving the best possible value for the labour that is completed. If you are seeking plumbing services in Canterbury, you can contact us through our website by sending us a message on the Contact page, or feel free to call us at any time. Even if you experience a malfunction at an unexpected time, we have team members ready to assist you any time and day of the week. We are open 24 hours a day, 7 days a week, so any emergency that happens to you, we are there to help you. If you live in the Canterbury area and require plumbing services, contact us through our Contact page, or via telephone. We will respond to your requests as soon as we can. The map below shows the service areas Endeavour plumbing offers in Canterbury, Victoria. For emergency plumbing services in the below service area in Canterbury, call us. We also provide plumbing services in Metro and surrounding suburbs such as our plumbing services in South Yarra, if you're looking for the quickest service speak to our expert plumbers today.